From humble beginnings it is now a multi-million dollar enterprise that dominates the miniature gaming market. Here is a feature on it from the BBC. Good for the lads! I never new Ian when he had hair. Seeing him with hair on his face and on the top of his head threw me a bit for a loop. Very interesting, but it cut things a bit short. I would like to have heard more. As an aside, I have no clue what *Laura Croft* had to do with the founding of Games Workshop. Media types miss no opportunity to be condescendingly ignorant. But at least "World of Warcraft" and "Mazes and Monsters" didn't find its way into the mix. Or introduced the concept of a 'Space Marine'? We would be without many, many, many of the people in this hobby. I feel old. I can remember a time when the White Dwarf had articles about Dungeons and Dragons. Tgunner, and Traveller and… Heck I even wrote one! Lara Croft is in the piece because Ian went on to run Eidos in Wimbledon after leaving GW. That has nothing to do with Games Workshop, but that didn't stop the reporter from making a leap in logic. OMG….this year will be 40 years out of High School…..
WD had articles for D&D, Paranoia and other games because GW had the print licence for them in the UK/Europe at that time. So it was still a "house organ" even then. There is a very good-looking book coming out soon, about the first years of Games Workshop. I am no fanboy but I've been playing their games since 1987 so I wish them the best of luck. No 1 Dalling Road, Hammersmith. Where it all started for me: Basic D&D and then the thrill of saving for and then buying the Advanced Player's Handbook, the GM's Guide and the Monster Manual. Not bad for a company that has been about to go under every single year since about 1992… that's how long I've been hearing it from the business experts on the Internet…. I remember trips up to London to visit Dalling Road, and then on to Peckham and Victoria for the two gaming shops there. You could say that about most big companies that have been around for 40 years. Great history of a gaming company that all too many gamers don't fully appreciate or understand! Oh, but wait…they're "about to go out of business"…for the thousandth time, lol. Where would we be if they hadn't created the hobby? Well I'd hardly go that far. As wargaming is far older than 40 yrs. Sooner of later someone would have come up with the same basic concept. "An expert is just that, one that's lost his "Spurt" (enthusiasm), so they just make up what they don't actually know." Never heard of Games Workshop until they gained control of Citadel. Not an impact in the USA when I started in the 1970s. I bought plenty of miniatures before they came along and never bought their stuff for my personal collection. And I stocked stocking their stuff in my store in 1985 when they began all of their purchase policies. So no they did not start the hobby. I don't believe that. Wargaming has not been around longer than Games Workshop. There may have been some sort of proto-wargaming but not actual wargaming. GW came up with that. HG Wells is laughing at you. I have been wargaming since 1969 and it was 'old' at that point in time. Putting aside the repetition of tired memes and the airing of old grudges, when did GW ever claim to have invented wargaming? They promote the GW Hobby, which is a form of wargaming, and very rarely acknowledge the existence of non GW wargames, but that hardly constitutes an attempt to take credit for or claim ownership over wargaming as a whole. T^SR produced historical games before D&D. Tricolor napoleonics was 1975, Panzer Warfare was 1975 and others. On the game side several companies are older than GW. Avalon Hill is obvious but SPI asw well. I got my subscription to S&T in 1970. Pictors and others drank the kool-aid. My store in the beginning was called Walker's Gift Shop. Later I would restart it in 1983 when I got out of the army to Time Portal. 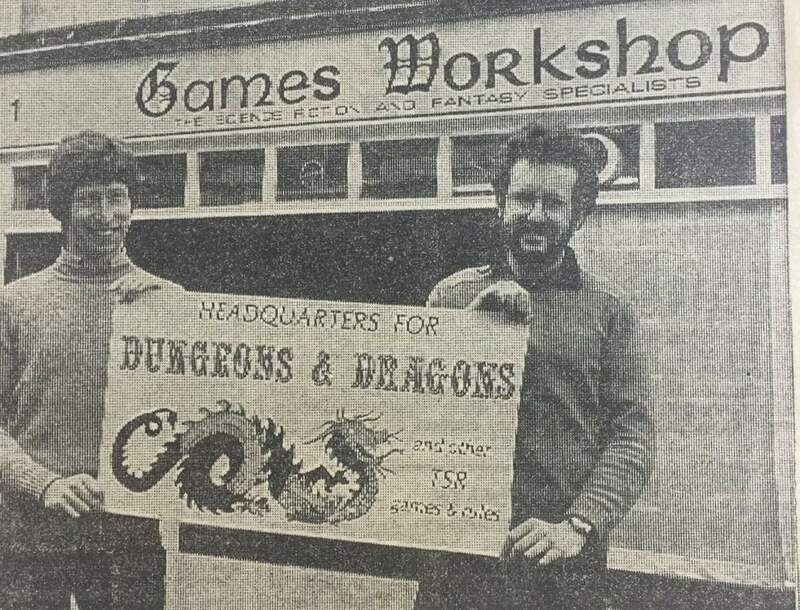 So I bought my first stock of games and miniatures in 1971. So even I have been in business longer than GW. LOL. The video plainly says GW owes its initial success to snagging the exclusive European distribution rights for D&D. No one is taking credit for pioneering wargaming. "They promote the GW Hobby, which is a form of wargaming, and very rarely acknowledge the existence of non GW wargames,"
There was also a shop in oxford street i think it may have been virgin in the 80`s. Upstairs had computer games and in the basement was the rpg and minis. In big glass units… But i cannot find out pictures or info for that period. It's actually a pretty amazing story of two lads being in the right place at the right time willing to take risks and follow what they clearly love! This really is one of those stories that is exceptionally rare (throughout history!). Then to have their creativity able to not just be put to use, but to make a living through it.